This is one of the easiest recipes to make, and very good. Adjust the garlic down if it’s not a favorite, and the classic tastes of lemon and oregano will make this dish mouth watering Greek. Preheat oven to 355°F Rinse the chicken and pat dry. Peel the potatoes and cut into quarters, lengthwise. Salt and pepper the chicken and potatoes. 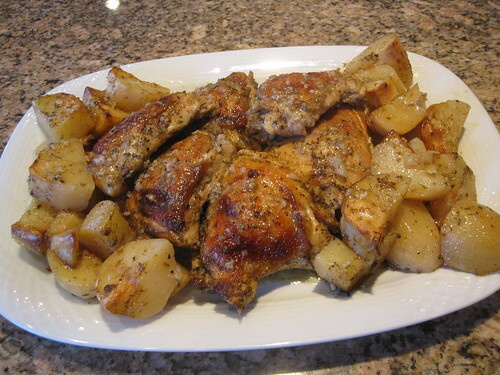 Transfer chicken to a roasting pan,skin side down for the first 50 minutes, and add potatoes, on and around the chicken. Add oregano, garlic, olive oil, and lemon juice, distributing evenly across the pan. Add water or broth and roast uncovered at 355°F for a total of 1 hour and 40 minutes. Half way through (50 minutes), turn the chicken skin side up. Hi Susie, so glad you liked it, thanks for posting. I made this recipee a few weeks ago. delicious!